"Just like printing on a sheet of regular photo paper!" 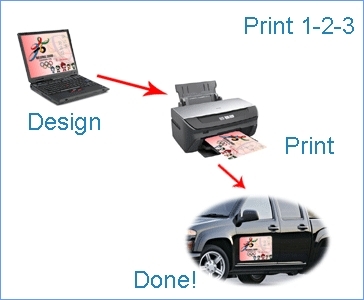 Making magnetic photo/vehicle sign is "as easy as 1-2-3"! 7. Click "Print" to start printing. *For inkjet printouts, please avoid rain or heavy fog for at least 48 hours. *For more detailed discussions, please see FAQs. 2. Press the signs on gently and make sure that all edges are in good contact with the vehicle. 3. Avoid surfaces with sharp angles or curvatures. *For more detailed discussions, please visit FAQs.